Our first guest post is brought to you by Lisa Murano at www.MuranoChickenFarm.com. Myth 1) Absolutely do not wash an egg before incubating. Reason: It washes away the 'bloom' and allows bacteria to enter the egg. Just brush off any dirt or don'tset the egg if it's too dirty. Common rebuttal: All the big hatcheries wash and sanitize their eggs first. Answer: well, yes and yes. First, you really don't want bacteria in your incubator. It could ruin your whole hatch. Second, yes the big hatcheries clean their eggs first...however we don't know their hatch rates...so we can't really use that as an argument. Myth 2) Do not use odd shaped eggs, or eggs that are abnormally small or large. Reason: larger eggs are often double yolk eggs which very rarely hatch. (and always need assistance)often small eggs are pullet eggs which shouldn't be hatched. Odd shaped eggs won't allow the chick proper room to grow and it will die in the egg or be malformed. 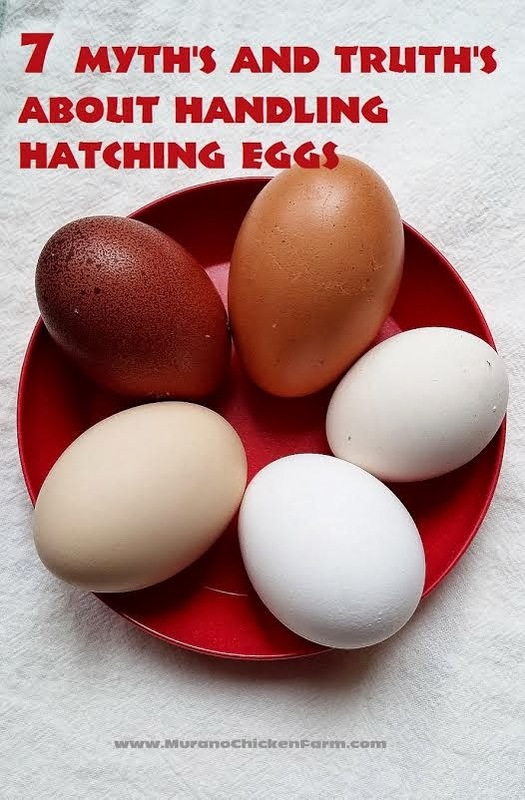 Common rebuttal: pullet eggs are perfectly fine to hatch, big eggs just hatch big chicks and it all depends on the odd shape. Personal experience: Lots of big chicks and no pullet eggs, however....I never incubate double yolkers. Myth 3) Eggs must be stored small side down before incubation. Common rebuttal: This doesn't matter unless the eggs were shipped or jostled in some way. Mama chicken doesn't sit her eggs on end before going broody. Personal experience: I try, really I do! Sometimes I end up with eggs in a basket before hatch though and they are laying all kinds of ways. I haven't noticed a difference in hatch rate. However I always allow shipped eggs to set upright to settle before hatch. Reason: It keeps the yolk from sticking to the side of the shell. Common rebuttal: It won't stick once it starts developing and is being turned regularly. Personal experience: I hardly ever do this. I forget all the time and I haven't noticed a difference. Answer: ummmm...all the research says to do it. Seriously, that's all I got on this one! Myth 5) Do not refrigerate eggs before incubation. Store at a humid 55-65 degrees. Reason: Humidity keeps the egg from loosing moisture. (eggs are porous) Temperature below 65 keeps the egg from starting to develop too soon. Temperatures too low destroys the eggs ability to develop. Common rebuttal: Fertile eggs from grocery stores and farmers markets hatch all the time. Cooptemperatures are not kept this stringent and a broody takes days to collect a clutch before incubating. Personal experience: Refrigeration seems to lower the hatch rate on average. Deviation from 50-70 have been fine. Eggs have been left in the snow covered coop for 2 days then have hatched. I don't recommend it, but I have pulled eggs out of the refrigerator and stuck them in the bator from time to time. Answer: This is a game of odds. Your best odds are when the proper temperature and humidity are kept, however they can still hatch if you deviate slightly from these. Myth 6) Let eggs warm up to room temperature before incubation. Reason: If the eggs are cold condensation can cause bacteria to grow on the eggs. Bacteria in your incubator can ruin the whole hatch. Common rebuttal: This one always seems to be "I tried it and it was fine"
Personal experience: I do this when it's too cold outside however....my storage is in my laundry room which is usually 60-65 and I never move them to a warmer room to warm up before incubation. I haven't noticed a difference. Myth 7) Don't incubate eggs older then 10 days. The hatch rate decreases after that. Reason: The egg begins to breakdown as it gets older and there is less of a chance it will develop and hatch. Common rebuttal: A mama hen often collects a dozen or more eggs before setting. At one egg a day, that is past the 10 day mark. Personal experience: If you're tight on incubator space, skip the older eggs...unless you really want that particular egg to hatch. Then what the heck, give it a try. Answer: This one is true....but remember we're saying the hatch rate decreases...so some will still hatch, but the older the egg gets the less chance there it that it will hatch. So, to sum it up....all of these points can contribute to your hatch. We all want 100% hatch rate and sticking to these points can help you get that. However, slight deviations may not impact your hatch too much.